Grab your boots and spurs and hat—it’s time to be a cowgirl! Way out west, the warm winds blow. and I’ll become a cowgirl. From sun up to sun down, the girl in this story pretends to be a cowgirl as she pulls on her (rain) boots, saddles up her (stick) horse, and gallops off through the (backyard) hills. 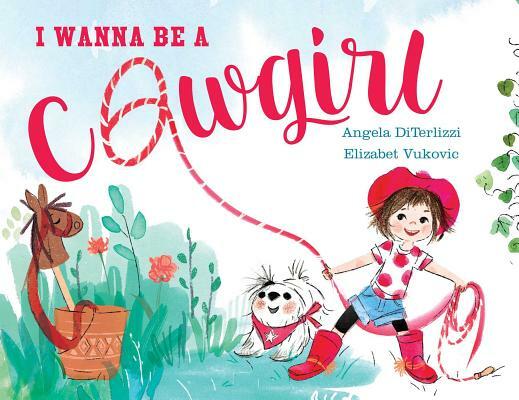 Filled with humor and imaginative play, this sweet story from Angela DiTerlizzi captures the dream of zillions of little girls everywhere—the dream of being a cowgirl! Simple, catchy text with a repeating line combines with a bright palette full of shiny red to follow the active, enthusiastic youngster and her trusty pup and kitten as she sets out with cowboy boots (rain boots), lasso (jump rope), and horse (hobby horse)....the charming and energetic story is easy to follow, and the give-and-take between imagination and real life is well-executed. This well may lead young readers to some pretending of their own. A girl with pink skin, tousled hair, and eager black eyes imagines life as a cowgirl “way out west,” and it’s pretty sweet. She saddles up her stick pony and heads to the backyard to milk the cows (two rubber gloves on a clothesline stand in for udders) and “take a bath/ right in the creek!” (a backyard wading pool), before moseying home for a well-earned night’s sleep. DiTerlizzi’s rhyming text is simple and direct, with the requisite down home lilt (“I’ll check in on my chicken coops./ I’ll make my rope do loop-de-loops—/ a lasso spinnin’, makin’ hoops”). In her first picture book, Vukovic (the Jasmine Toguchi series) depicts her stylish heroine in a wide range of framings—she comes across as wholly independent and powered by boundless, sunny energy. But what gives the pages the strongest impact—and a vibe of vintage commercial art—is the combination of a breezy sketchlike style and a limited palette: red for anything associated with cowgirl fantasy, and grassy green for just about everything else.